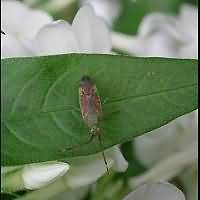 The Blushing Plant Bug is a close relative of the Grass Bug. And it changes its colours too: starting off red and green, it turns into dark red later on. Reaching a length of 9 to 10 mm it is about the same size the Grass Bug is, but because of its shape, it does appear to be bigger still. In the summer of 2001 there were very few bug species in our garden. Of the species present there were a lot of individuals though. 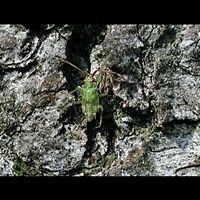 The Blushing Plant Bug however was not only new to our garden, we have seen but one individual and on one occasion only. Usually the adults can be seen from August to the end of October, on olm and birch mainly. The Blushing Plant Bug is a common species in Britain and England, but not as abundant as the Grass Bug. This is a species of Northern and Central Europe, getting scarcer going southwards. This page has last been modified on Sunday, November 04, 2018.